Step 1. Gather all ingredients together. Line a slice tray (15cm x 30cm) with baking paper and set aside. Preheat oven to 200°C (180°C fan-forced). Step 2. Place flour, sugar and cocoa in a bowl and mix together. Add eggs, vanilla and butter and whisk until combined. Place 4-5 tablespoons of brownie mixture into the tray and spread to cover the base. Step 3. Place 2 rows of 5 Tams on top of the brownie mixture. 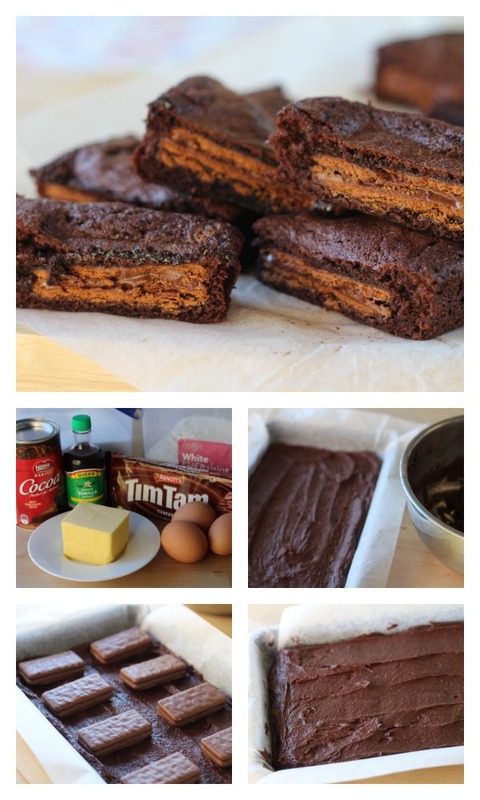 Pour remaining mixture into the tin and smooth over to cover the Tim Tams. Step 4. Bake for 25-30 minutes or until lightly baked through. Cool and cut into squares or fingers and serve. You can use any of your favourite chocolate biscuits to hide in this brownie mixture. I do like the idea of a Mint Slice hiding in there. Baking time on these brownies will vary on how you like your brownies. If you want them soft and gooey then 25 minutes is perfect. If you want them firmer I would bake them for 35 minutes.